Chicken and chips with style from the legendary Frango Petersham Charcoal Chicken. It's Saturday lunchtime and DonnaChang and I have just written up a blog post on the amazing Portuguese feed we had at the legendary Fernando's in Macau. It made us hungry for Portuguese chicken so we scoot over to Petersham, Sydney's little Portugal. As usual we don't do any homework, we just pick a restaurant that looks right, and we happen to pick a legend, Frango Portuguese Charcoal Chicken. It is packed, the crowd appears daunting however we learnt that if you get a chook which is ready to go, rather than burgers which are cooked to order, you are in and out very quickly. Frango Petersham Charcoal Chicken Menu. Drool. A whole chicken in home made peri peri chili sauce for $13.50 with a huge serve of chips for $3.50. The chicken was wonderful at first bite, which is saying something because bbq chook is normally boring to my Asian-obsessed palate. After a few bites however the salt factor kicked in, one piece was enough for both DonnaChang and I. 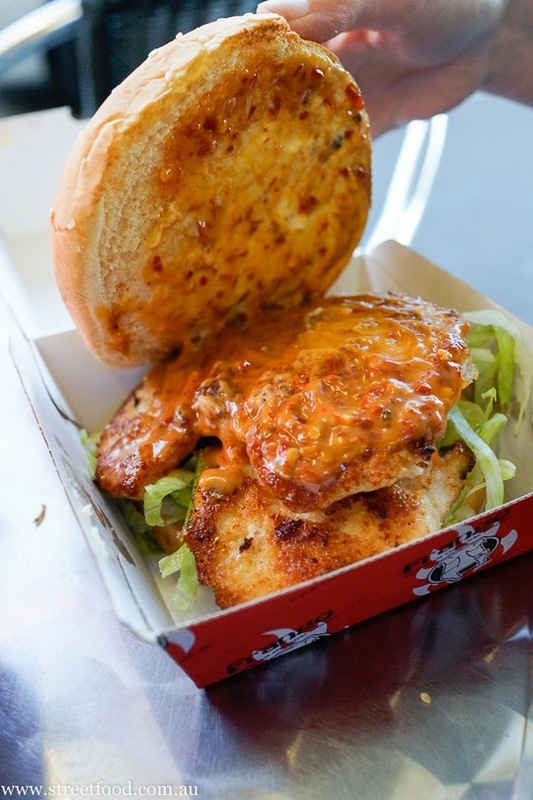 We liked it but it didn't blow our minds like the chook we had in Macau, though we are keen to come back and try it without the peri peri to see if it less salty. Our friendly neighbourhood butcher bird flies in as soon as we put the chicken on the table. Codfish croquettes, $2 each, a Portuguese classic. Portuguese soft drinks, these are a not quite as uber sweet as the soft drinks we are accustomed to, thumbs up. It's three years since our last visit, but the joint is just as busy. It's hectic and a bit of fun if you're in the mood for it. The lady who served us was super nice, smiling and cracking jokes amidst the chaos. 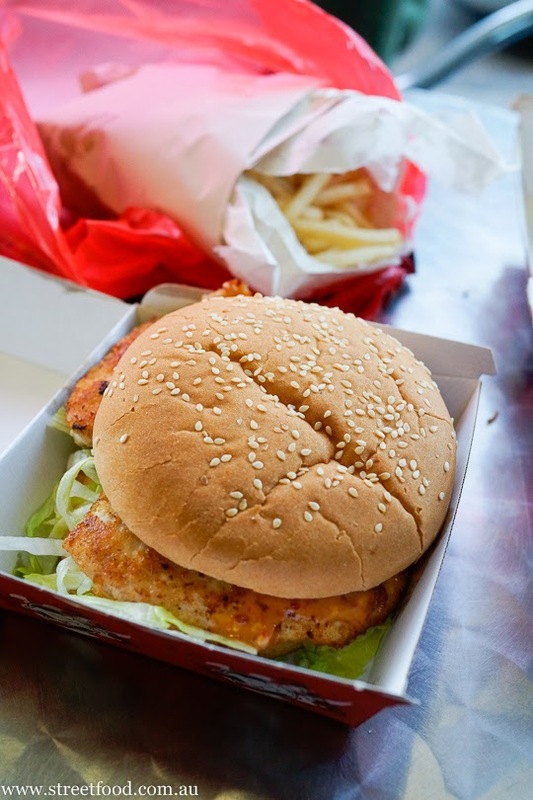 We go for original Portuguese chicken burgers. These come with a couple of good size pieces of chook. They're good burgers, nice and fresh and the chili sauce is wonderful, it's miles and miles ahead of our local Oporto's. $5.50 for a chicken burger this good is a bargain. We asked for no\little mayo because man, they slap a mound of mayo on those suckers. 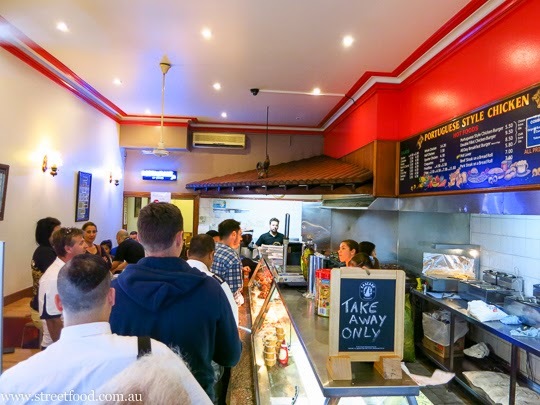 Frango Petersham Charcoal Chicken is at 98 New Canterbury Road Petersham. There's a restaraunt out the back and takeway in front. These guys have been around for 20+ years and have a huge following. For Chicken Burgers try Rio Barra at San Souci, much better by far, great food not so crazy and no attitude from the owner!!! That price for the chicken burger is amazing! Definitely worth a try when you have so little to lose!